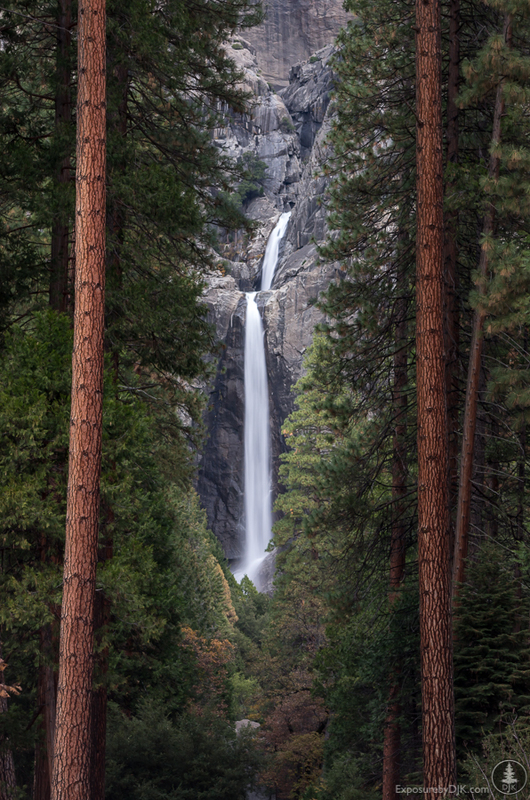 For framing, my goal was to use the trees to frame the falls, provide scale, and depth. To do so, I used a telephoto lens, though on the wider end (70mm). I backed up a bit to both frame the falls and to try and reduce the angle that I was shooting upward at. Using the histogram, I took several shots until I was just about to over expose the water; that way I had enough detail in the water still while also minimizing how dark the trees in the foreground were. I also balanced all of that – by adjusting the aperture and ISO – with a slow shutter speed to smooth the water. Processing included, all in Lightroom: adjusting the white balance (it was a little on the cool/blue side to start), adjusting perspective and cropping, though when I was there I did note that the trees leaned in a little, so I made sure to not totally remove the trees leaning; exposure adjustments to bring up the trees a little; highlight adjustments to tone down the brightness of the water slightly and bring back some detail; white & black point adjustments; and a touch of clarity (+17) and vibrance (+7).